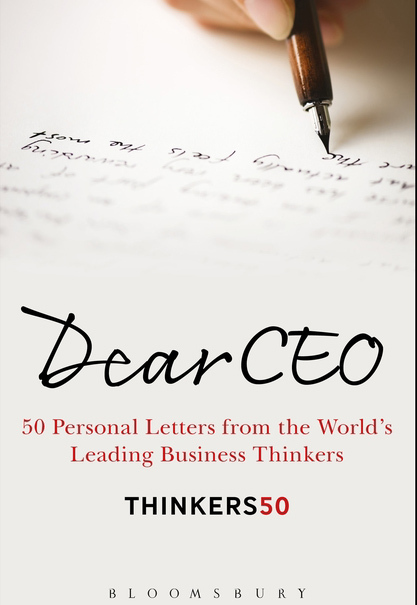 Thinkers50, the brainchild of the business journalists and authors Des Dearlove and Stuart Crainer, asked me for a contribution to “Dear CEO,” published by Bloomsbury in the summer 2017 and featuring letters from Tom Peters, Whitney Johnson, Henry Mintzberg, Dave Ulrich, Enrique Dans, or Marshall Goldsmith, among others. To find the book including all 50 letters, click here. My missive explains to a hypothetical CEO how the most pressing challenge facing leaders today is to gain trust and respect from their followers, something that will dramatically change the way they lead themselves, their teams and organizations. If you are like me, you are probably shocked and disheartened by the number of cases of corruption and unethical behaviour and how they have contributed to a crisis in leadership. As a result, the business world has become more sceptical of formal rules and increasingly reliant on personal relationships. I’m not advocating that you simply copy the style of other great leaders. Rather, I’m talking about looking inside yourself to discover the heart of your authentic style and then using your passion to motivate your employees. Furthermore, you should be looking outward for feedback to reinvent yourself and make learning a habit; and looking after your employees to strive for harmony so that they can shine. I think of this as the “3 H’s of Authentic Leadership”: Heart, Habit, and Harmony. To become an authentic leader, you don´t need to fall into the mentality of a super-hero. Instead, shift to the mind-set of unsung heroes.